I look back at The New Dreamland Arena roller skating rink with a great deal of affection and warmth, because it occupied a small chapter in my life before World War II, while providing many social and recreational pleasures. The New Dreamland Arena celebrated its Grand Opening on a Friday night, October 10th, 1941, and I spent nearly every free night I had at that rink until the night of November 16th, 1942. That was the night before the morning I reported for induction into the Army for my World War II service. The New Dreamland Arena name included the word "New" because the owner/manager/builder1 was Victor J. "Buddy" Brown, who, many years earlier had operated a roller rink called the Dreamland Arena in his amusement Park, Dreamland Park, half a mile down Frelinghuysen Avenue, and adjacent to Weequahic Park. The earlier Dreamland Arena roller rink had been converted for use from a Park dance hall. During the 1920's "Jazz Age," the floor had been the site of American's first Dance Marathon. 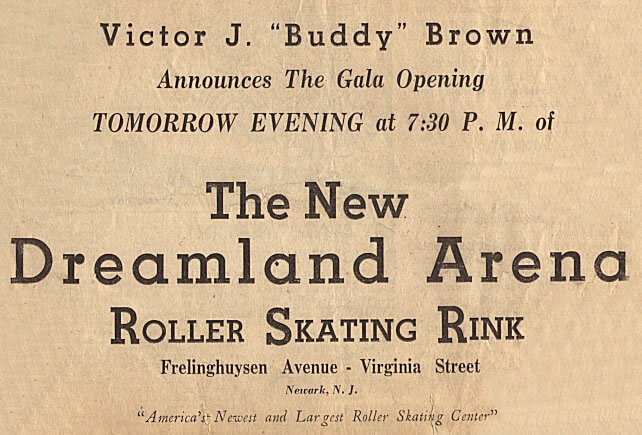 The New Dreamland Arena, at 985 Frelinghuysen Avenue, at Virginia Street on the Elizabeth City line, was advertised as "America's Newest and Largest Roller Skating Rink," -- and it was up to that time. In an October 9th, 1941 interview in the Newark Star-Ledger, Brown described his about-to-open new rink as an advanced-design rink of the future with a new "Floating Rotunda" floor which Brown called "science's latest contribution to the roller skating pleasure." Brown said, in that same article, it embraced a new principle of floor construction that gave the skater a buoyant sensation unlike anything ever before experienced, and, he added, it was the only floor of its kind in the world. Another feature of The New Dreamland Arena was its specially-built organ, tabbed the "Mystery Console" with master effects. Brown employed two organists at the rink to provide the music at the daily evening sessions, and at the matinees on Wednesdays, Saturdays, and Sundays. The rink organists were Charles (Charley) Vanderhoven and Marie Corbett. I recall Charley Vanderhoven with great affection because I once composed a song called "The Dreamland Lullaby". As I was ignorant of music writing, I had hummed out the tune for Charley and he wrote an arrangement for my lullaby and retained it for me. Every once in a while when I was skating at the rink and the waltz number came on, Charley would play my "Dreamland Lullaby" with a lot of organ flourishes, and I would be on Cloud Nine. A popular evening gathering spot between skate numbers was the rink Soda Fountain, located near the front entrance between the coat room and the skate-rental room. It was run by Jerry Garner, than a 16-year old sophomore at Thomas Jefferson High School in Elizabeth. He recalled for me recently that the most popular item was a small bottle of off-brand soda. He said "It sold for a dime when a dime was a lot of money." He added "I seem to recall that night time admission to the rink was thirty five cents." The building had been constructed at a cost of $300,000, which, if translated into present-day dollars would have been in excess of $3.5 million. The professional staff, from opening day, was headed by Betty Lytle2, recognized as America's top professional roller skater. Bob Ringwald was in charge of the male rink professional staff. From years of skating at another Brown-owned rink on Route 22 and continued patronage at Dreamland, I'd developed a warm friendship with Vic Brown, but I did not know that the rink proprietor had done more to legitimize the roller skating sport than any other individual in America, and that, generations later, he would be looked upon by roller industry leaders as "The Father of Roller Skating in America." Brown had almost single-handedly organized the roller rink operators of America into a nationwide organization, called the Roller Skating Rink Operators of America, or, RSROA, and had established the RSROA as the governing body--fully amateur controlled--for the national skating sport. Brown was the organization's first president3. 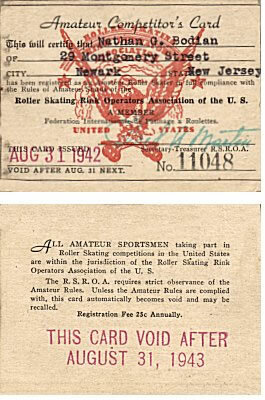 I was a registered "Amateur" with the RSROA, and still have my RSROA "Amateur Competitors Card No. 11048 , renewed August 31, 1942." Earlier, as a registered "Amateur" skater, I had earned my bronze junior figure skating medal at the Dreamland rink, judged by an outside team of RSROA referees from other rinks. Made Roller Skating a "Class Sport"
Vic Brown was passionate about making roller skating a "Class sport." He recalled for Joe Donovan, Sports Editor at the Newark Star-Ledger, on November 12, 1941, that before he got involved, "roller skating was a wild raucous pastime. "It came out of the gutter, so to speak, because roller skating was often dome more in the back yard, if not on the streets." Sports columnist Donovan then wrote: "It was Brown's idea to inject some distinction or class into it. He did." 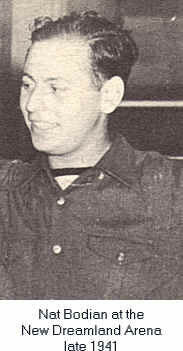 As my early sports-writing mentor, Joe Donovan, had written, it was Brown's desire to make the roller rink a family entertainment, and, while I skated at The New Dreamland Arena, it was not uncommon to see mother's fathers, and children, seated together as a family, and skating independently at various times. 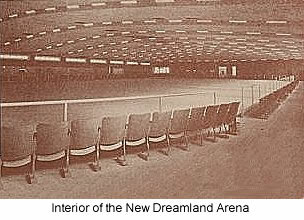 In keeping with maintaining the rink's social environment, a rink newspaper, "The New Dreamland Arena Skating News4," was issued periodically. I contributed articles to this rink paper. Here were The New Dreamland Arena's posted "Summer Dress Rules" the last summer I skated there" Gentlemen must wear a tie with all dress shirts. Polo shirts are permissible provide they are clean and not too extreme. Gentlemen may skate in shirtsleeves, but suspenders must not be exposed. Dungarees or overalls are strictly forbidden. Other Rules" Fast skating, playing tag, smoking on rink floor, and petting are strictly forbidden. The management has the right to refuse admission to any objectionable persons and the right to eject any person breaking the above rules. I was overseas during the World War II years, but corresponded regularly with Vic Brown, and he kept me informed of happenings at the rink. His letters were warm, friendly, and detailed. In one of his letters to me, dated July 27, 1944, at my Belem AAF Air Base, Brown wrote in part: "...haven't heard any further from Bob (Ringwald) since the telegram telling us he was wounded in action in France ... Betty (Lytle) just came back from Florida where she enjoyed a rest after the hectic season she put in coaching and producing shows and contests ... and , yes , I am planning on opening a chain of roller rinks after the war is over ... I have some wonderful plans in mind that will make Dreamland look small in comparison." I am holding a clipping from the Star-Ledger dated October 19, 1945, telling how Vic Brown invited 20 war amputees from Thomas M. England General Hospital in Atlantic City, all of whom had lost a leg in combat, to skate at the rink aide by "ten professional skating instructors -- all very pretty." The article goes on to say the "Lt. Robert K. Ringwald, now a patient at Halloran General Hospital in Staten Island, watched the skating GI's and the instructors from the sidelines until he could no longer resist the temptation to put on skates." The Star-Ledger article of October 19, 1945 stated further that Ringwald had sustained severe injuries while parachuting into Normandy on D-Day, and been held prisoner without his injuries being treated. He was now undergoing operations at Halloran Hospital to repair some of the war damage. school classes in New York's Greenwich Village ended at 10:10 PM, my future mother-in-law permitted me to call if I got there by 11:30 and left by midnight. We are now married over 55 years, and "The New Dreamland Arena" is just an "old" memory. Vic Brown, born in 1897, died in Newark on December 23, 1968. Funeral arrangements were made by his son, Vic, Jr. and Vic, Jr's wife Lois, who had lived in East Orange. Brown had been infirm for some time. A corpulent man, he had lost considerable weight, and at the time of his death weighed 150 pounds. Brown's wife Tillie, a constant attendee at his skating rink and fondly recalled by Dreamland skaters, at the time of Brown's death was suffering from Alzheimer's and a resident in the Westfield Nursing Home in Westfield. She died there in 1973.